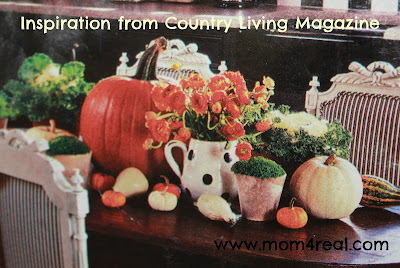 It’s no secret that Country Living Magazine is one of my absolute favorites. I have been reading it since I was around 8 years old thanks to my Mom and Grandmommy. I have hoards of pages that I have torn from old issues that had gotten too worn to keep anymore. There is one page that I get excited about every time I come across it, and I finally decided to try and replicate. Above is a photo of that page. It is quite worn, because every Fall I take it out of it’s folder and hang it on the fridge. I have always loved the black and white polka dot pitcher, and got around to painting my own about a month ago. And the pumpkins…there is just something about pumpkins. I adore them! I love the mix of black and white with the different shades of orange. It’s like those colors were born to be together. Now, the cabbages were not easy to find. I searched different garden centers, and finally found some at the Farmer’s Market. I tried to dig up some moss from our back yard for the pots, but it really didn’t work out. But, that’s okay, because I had a bag of spanish moss, so I could improvise. Do you have a magazine page that you’ve held onto for years? Jessica! This is fabulous!! How cute is that??? Great job, girl! It’s nearly a dead ringer! WOW! I love it! Country Living is one of my favorites too! Very Cute Jessica! I don’t even know if I still have any magazine clippings, I’ve been doing so much purging lately! LOL It turned out great though, thanks for sharing! Love It!!!! Great copy cat!! Just great! You are just a doll face Jessica. I can’t believe you have all those old mags. This looks so cute. LOVE the polka dot pitcher too. Thanks for sharing my friend! Your copy is so pretty!! 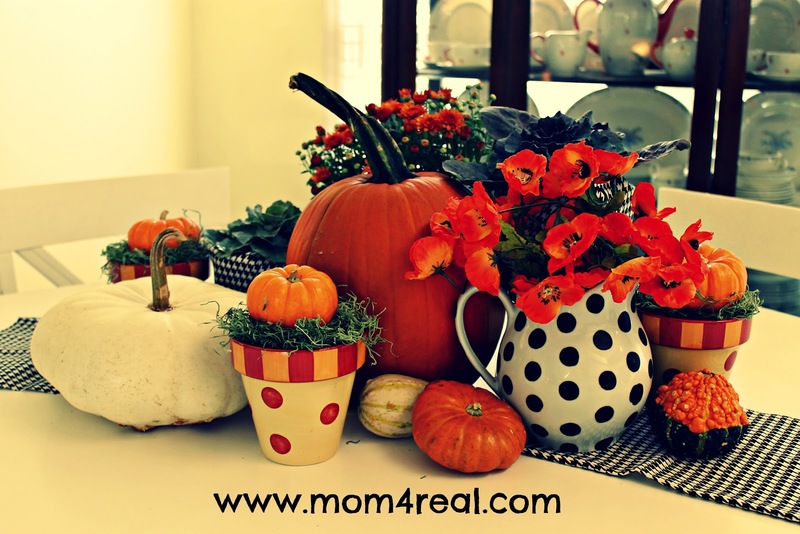 Would love to have you link up to our Pumpkin Linky Party. So pretty. I’ve never saved a magazine page like that….maybe I should start?! I’m visiting from 52 Mantels! Jessica, this is a great copy! Love the colors! 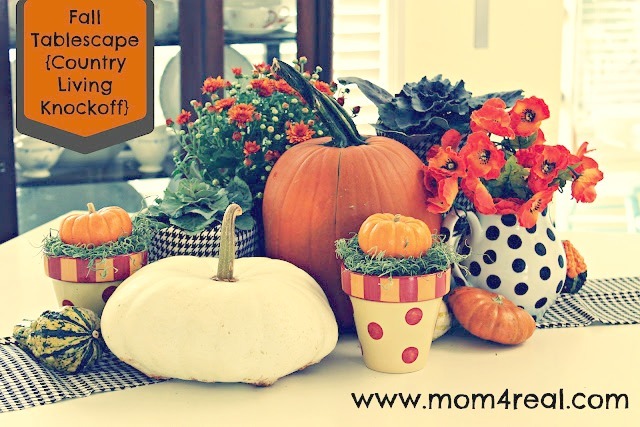 Your copy cat is lovely….So much color and perfect for this time of year. Gotta love those great magazines. Jessica, you rocked the challenge. Love your adorable tables cape! Oh my you really captured it well! I love that you have had this on your mind for a while and followed through with the idea! I can see why you liked it and yours is awesome! Great job! OOO, Jessica, your version is MUCH prettier. What a great job….I love everything about your copy. Fantastic copy. Love your much better. The polka dots are so cute. You polka dottie pot it so dang cute! Good thing you saved that page because you have really brought it to life. Beautiful! And you know what? I like your’s even more than the pic! Thanks for the inspiration! This is so pretty. I love the boldness of it and yet perfectly chi and Fall. So cute! Love the polka dots too! Absolutely terrific! You take great photos too. I think I like yours better! My weekly linky party–One Creative Weekend–has gone spooky this week in honor of my thirteenth party. If you haven’t already, I hope you’ll visit “One Creative Weekend” on OneCreativeMommy.com (open every Fri-Wed) and link up this idea and anything else you’d like to share. (You can include non-Halloween posts as well, but feel free to link up as many Halloween-themed posts as you like.) There are two categories—one for Halloween and one for everything else. I save magazine clippings all the time. I love your arrangement but would like to know how you painted the pitcher. Are the polka dots permanent? This tablescape is so cute. I really like the polkadots. Jessica you did a lovely job on your table! 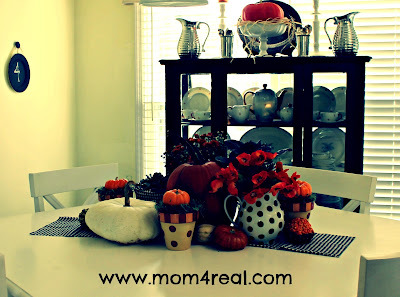 Thanks for linking it up to the Traditions Thanksgiving Linky Party! Love those rich, warm colours. I love yours and I think yours is way better! No wonder you held onto that page from Country Living – it’s gorgeous. And your replication is even better! Love, love, love black, white and orange mixed together. Thank you so much for linking up to the Better Late Than Never Thanksgiving bloghop! What a great post. This just cheered up my day. love your tablescape ! I love this and the story behind it. I’ve got a stash of old magazine inspiration from BP — that would be before Pinterest — and it’s always interesting for me to see how my taste has evolved over the years but also how there are some common themes throughout. Thanks for sharing this at our party and inspiring me.